"That towering pyramid, set off from its neighbors, seeming to thrust into the very sky, was the object, more than any other Alpine peak, of a host of superstitious tales. In both valleys affording access to the mountain, the Mattertal from the north, the Valtournanche from the south, old men told dark tales of the awful disasters that would assuredly befall those who dared to come too near to it. There were stories about ruined cities buried beneath the snow-masses. In addition the opinion of experienced Valais guides in Zermatt, on the Swiss side, was that the mountain was so steep, a succession of smooth cliffs from base to summit, as to be quite unclimbable." The Italian side of the mountain looked more promising, and several groups--both Italian and British--tried unsuccessfully to reach the peak via the western slope. In 1861, a 21-year-old Englishman and amateur artist named Edward Whymper visited Zermatt. While sketching the Matterhorn, Whymper became interested in climbing. One thing led to another, and Whymper made several attempts on the Matterhorn over the next few years. In 1865, with a large Italian party scheduled to assault the peak from the southwest ridge, Whymper hastily put together a group of climbers and headed for the mountain's Swiss side. The young Englishman and his climbing friends reached the summit at 1:40 p.m. on July 14, 1865. All went well until, during the descent, one of Whymper's companions slipped and a rope broke, sending four climbers to their deaths. The resulting newspaper coverage whetted the public's interest in both climbing and the Matterhorn, and a new tourist industry was born. Today, more than 3,000 aspiring Alpinists hire guides and attempt the Matterhorn every year. (The route is easier now, thanks to a network of fixed pitons and ropes over the trickier sections.) And every year, a few tourists die on the mountain--usually by attempting to climb it on their own. Should you crawl (or get hauled) up the Matterhorn? At least some climbing experience. Proper equipment (i.e., boots and clothing). A week of preparation, preferably under the supervision of Zermatt's mountain guides. SFr 1215 or more to cover the cost of a licensed guide and related expenses. 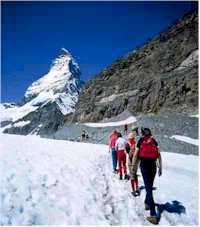 A better alternative might be one of the various hikes and excursions offered by the Zermatt Tourist Office and the local Bergf�hrerb�ro, or mountain guides' office. These range from "Walking and Painting in Water-Colors" to "Matterhorn Trekking." "Take the cogwheel train and leave the climbing to us"
Another option is the Gornergrat mountain railway (see article link below), which hauls more than 3,000,000 tourists to an elevation of 3,135m or 10,256 ft. each year. At the upper station, you'll enjoy a great view of the Matterhorn and neighboring Monte Rosa--assuming that the weather is cooperative. An illustrated article with links to ski pages about Zermatt. Why get all sweaty and dirty climbing the Matterhorn when you can enjoy a view from your balcony at a five-star mountain hotel? The resort's official tourism site has information on hotels, restaurants, mountain guides, events, etc. Don't miss this fascinating history museum during your Zermatt stay. Its exhibits include photos, models, and historical objects (such as the rope that broke after the first ascent of the Matterhorn, sending two climbers to their deaths).